The unmanned Japanese spacecraft Hayabusa2 has arrived at asteroid Ryugu, currently located 284 million km (176 million miles) away from Earth. The spacecraft will attempt 3 brief touch-and-go landings over the next 18 months to collect samples and return them to Earth in December 2020. After a journey lasting 3 and a half years, JAXA's ion-powered Hayabusa2 spacecraft has reached its base operations on June 27, 2018, and is currently located about 20 km (12 miles) from asteroid 162173 Ryugu (formerly known as 1999 JU3). The asteroid's estimated diameter is 900 m (3 000 feet). The spacecraft carries 3 small landers and a rover designed to investigate Ryugu's surface after being deployed from the mothership at about 60 m (200 feet) altitude and freefall to the asteroid. Over the next 2 months, scientists will be looking for suitable landing places and attempt the first touchdown in September or October 2018 and the second in February 2019. The third touchdown is scheduled for April or May 2019 before which they plan to hit the asteroid with a projectile to create a crater. To remove the space-weathered surface and collect a fresh sample, the spacecraft carries the Small Carry-on Impactor or SCI. It is a small drop-off explosively formed penetrator, consisting of a 2.5 kg (5.5 lb) copper projectile contained in a 4.5 kg (9.9 lb) shaped charge. The SCI impactor will be released by the spacecraft at about 500 m (1 640 feet) altitude above the asteroid surface. A second instrument will then be deployed: the deployable camera (DCAM3). This camera will observe the explosion of the impactor that will strike the asteroid with a velocity of 2 km/s (1.2 mi/s). The crater formed by the impact and explosive charge will be the site of further observations by the spacecraft. As the sampling horn touches the surface, a 5-gram Tantalum bullet will shot at 300 m/s to the surface of the asteroid, and the resulting ejecta is expected to be collected by the sampling horn. The ejecta is expected to move to the sample catcher by its own momentum under microgravity conditions. MASCOT lander is expected to be deployed in July 2019. Hayabusa2 is a successor of the original Hayabusa mission, the first human mission to successfully return small pieces of an asteroid to Earth. Hayabusa was launched in 2003 and rendezvoused with asteroid Itokawa in mid-September 2005. 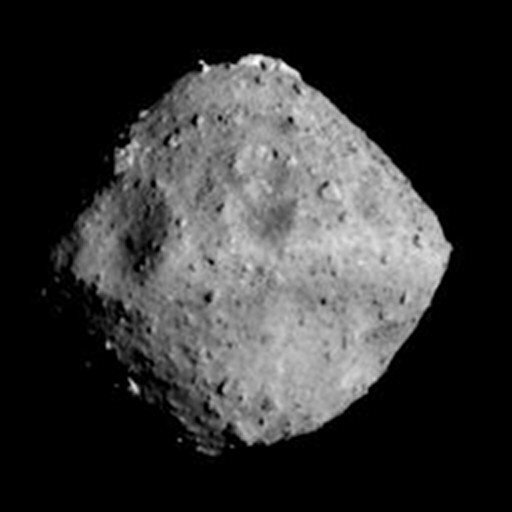 After arriving at Itokawa, Hayabusa studied the asteroid's shape, spin, topography, color, composition, density, and history. In November 2005, it landed on the asteroid and collected samples in the form of tiny grains of asteroidal material, which were returned to Earth aboard the spacecraft on June 13, 2010. Hayabusa2 is expected to depart asteroid Ryugu in December 2019 and return to Earth in December 2020.